The appearance of the C141 Starlifter in the 1960s seemed very interesting because unlike other airframes, it doesn’t have a prototype that came out before its production. Due to its impressive cargo and transport capabilities, it became USAF’s workhorse transport plane. It was on August 23, 1963 when President John F. Kennedy unveiled the Starlifter from the White House via a remote control. Kennedy announced that it was “great moment for our nation” while grandly pressing a gold key that launched and set the Lockheed C-141 Starlifter in motion, even if it was positioned in Marietta, Georgia, which is 650 miles away from the nation’s capital. This legendary airframe holds several “firsts” for the U.S, such as being the first jet-powered airlifter, the first jet-powered airframe to serve the US Army paratroopers, and the first jet-powered transport plane to land in Antarctic. The Starlifter aircraft proved invaluable in different missions including the war in the Persian Gulf, Iraq, and Vietnam, where it gained the moniker “Hanoi Taxi” for transporting 500 American prisoners of war from North Vietnam. 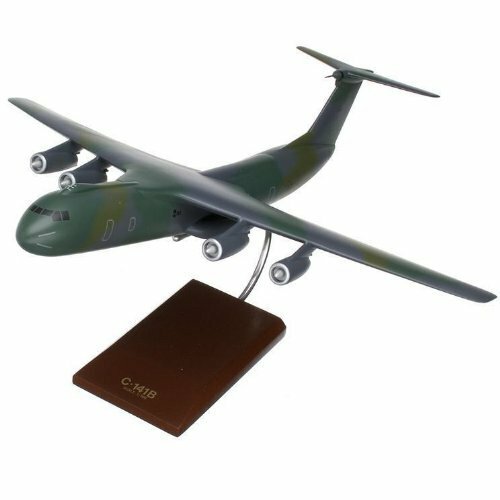 The proud career of the Lockheed Starlifter concluded on May 2006, but you still have the chance to own one by getting this museum-quality scale model aircraft and putting it up for display right at your living room, bedroom, or office workstation. An accurate representation of the actual C-141, this model aircraft was made according to the blueprints of the original. All the details are faithfully mimicked in this replica—even the insignias and other markings are done elaborately. Get this desktop model aircraft now! It comes ready for display on its elegant wood base and sleek chrome detachable stand.